Ballooning was a very dangerous profession, and certainly not one you would think suitable for a late 18h/early 19th century woman. But Sophie Blanchard wasn't your average woman. Although she wasn't the first woman to ride in a balloon, she was the first to make it her profession. She became so skilled that she could ride alone, and, with her exploits, she entertained the most powerful and influential personalities of her time, including Napoleon Bonaparte, who made her "Aeronaut of the Official Festivals". It's all the more astonishing because Sophie, who had been born on 25 March 1778 in France, easily startled at loud noises and hated riding in carriages. 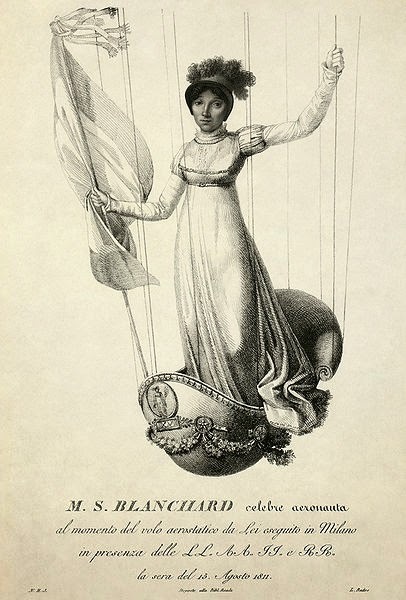 Balloons entered her life when, as a young woman, she married Jean-Pierre Blanchard, one of the most balloonist of the era. During his career, Jean-Pierre, had helped pioneer parachutes, and toured both Europe and America, setting new records wherever he went. But the money he made was never enough. Jean-Pierre had no idea how manage his money and, as a result, he was always in debt. In an attempt to make more money, he recruited his wife to perform with him. The two were one of the main attractions at important ceremonies such as coronations, opening of new buildings and birthday parties. Performing was risky and poor Sophie often shivered in her balloon so high up in the sky and sometimes, when her balloon went too high up, also fainted for lack of oxygen. Once, when she landed in a swamp, she almost drowned. Yet, Sophie was unfazed. Scared on land, she was fearless in the air. Apparently, she even claimed once that she would rather sleep in a balloon than on land. Sophie attracted lots of attention with her flights, both with her husband and alone. Napoleon was so impressed that he also appointed her as the Chief Air Minister of Ballooning. Her job was to draw up plans that would allow him and his army to fly over to England and conquer the country. Sophie accepted the post, even though she knew no plan would ever work. Balloons were hard to control, especially when the wind blew the wrong way, which was often the case. 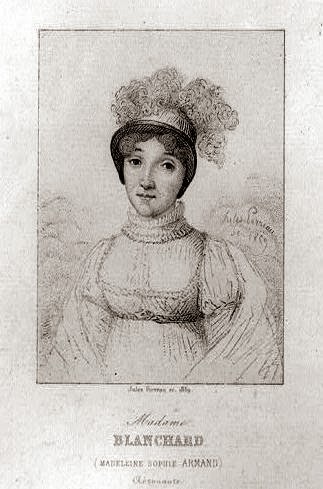 In 1809, Sophie became a widow. During a performance, Jean-Pierre had a heart attack and plunged to his death. 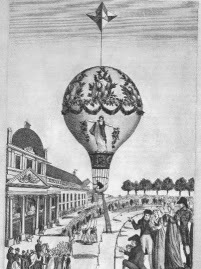 Sophie, though, continued to perform solo, mostly at night, in her hydrogen-filled balloon, which also featured a small basket below. 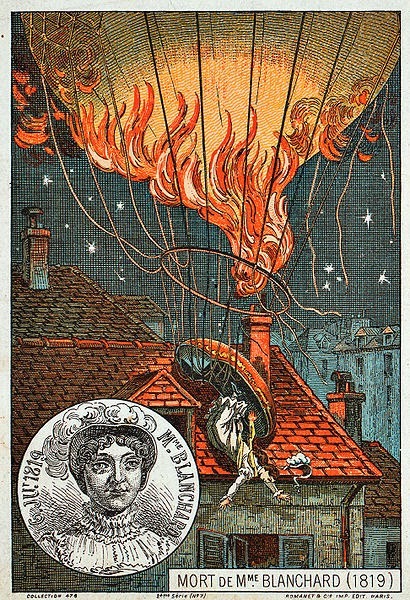 She even perfected an act that would force her to face her fear of loud noises: she lighted fireworks in her balloon and tossed them below. The crowds loved it. Her career took her to Italy and Germany, but she also continued to work for Napoleon, performing at his 42nd birthday party and at his wedding with the Austrian Archduchess Marie-Louise. When their son was born, she also distributed leaflets announcing the happy event from her balloon. When the Bourbon monarchy was restored, she also performed for Louis XVIII, who made her "Official Aeronaut of the Restoration". Sophie knew, though, how dangerous her profession was, and that every flight could be her last. Like her husband, she too, died while performing. The accident happened on 6 July 1819 at the Tivoli Garden, Paris. That day, Sophie was more nervous than usual, probably because her performance required more fireworks than she normally used. Some spectators warned her that the performance was too dangerous but, others, eager to see the show, implored her to go on with the show. In the end, Sophie agreed and, stepping into her balloon, she said: "Allons, ce sera pour la dernière fois" ("Let's go, this will be for the last time"). Unfortunately, she was right. During the performance, her balloon caught fire. Entangled in the cords of her basket, Sophie fell to her death. The crowd, and all her admirers, were shocked and distraught. When they heard of the tragedy, the owners of the Tivoli Gardens decided to donate the admission fees to support her children. Some of the spectators also appealed to the Parisians for money. But Sophie had no surviving children. The money was then used to build her a memorial, which was topped by an image of her balloon in flames, above her grave in the Pere Lachaise Cemetery in Paris.